In a large bowl, cream butter and sugar until light and fluffy. Gradually add eggs and vanilla. Mix well. Sift together flour, baking powder, and salt. Stir flour mixture into the butter mixture until well blended. Divide dough in half and wrap in plastic. Refrigerate dough for three hours. Preheat oven to 350 degrees F (175 degrees C). Grease two cookie sheets or line them with parchment paper. On a floured surface, roll out half of the dough to 1/8 inch thickness. Cut dough into star shapes using a 3- to 4-inch star cookie cutter. Using a 1- to 2-inch star cookie cutter, cut a star into the center of half of the big stars. Place the full stars on one cookie sheet and the "tops"--the cookies with the center cutouts--on another. Sprinkle colored sugar on the star tops, if desired. Bake in preheated oven until edges are golden brown, 6 to 8 minutes. Allow cookies to cool completely. (You can re-roll the mini stars cut out of the centers, or bake them separately for about 5 minutes.) Repeat with remaining cookie dough. 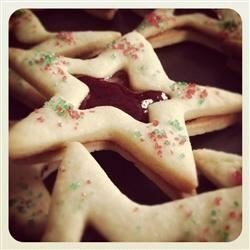 After cookies cool completely, spread 1 teaspoon of preserves in the center of each full star cookie. Place a cut-out cookie on top of the layer of preserves. Pack cookies between waxed paper in a covered tin to preserve freshness.